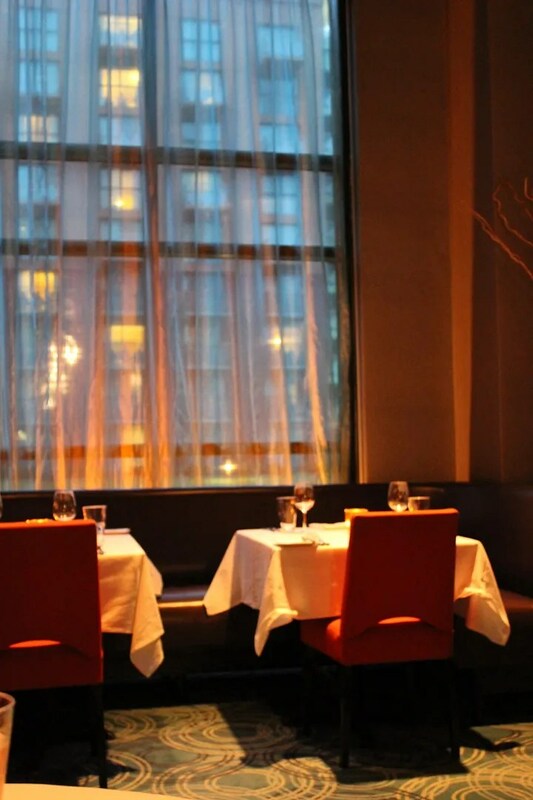 BACKGROUND: This would be our first visit to bluezoo and I was really looking forward to it. 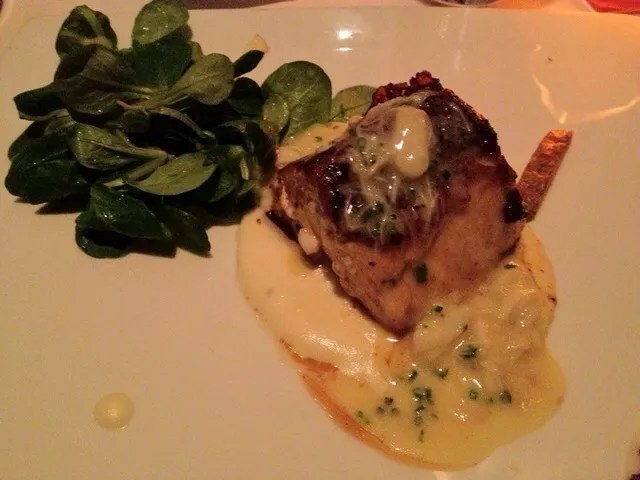 On our last trip we tried Shula’s (the other signature restaurant at the Dolphin) for the first time and although I was disappointed with my steak, the rest of the food was very good and I would definitely rate it higher than our meal at Il Mulino at the Swan. So where would bluezoo fall in my rankings of the Swan and Dolphin Resort signature restaurants??? Please continue reading to find out. First of all I must say that I found this restaurant to be visually stunning! 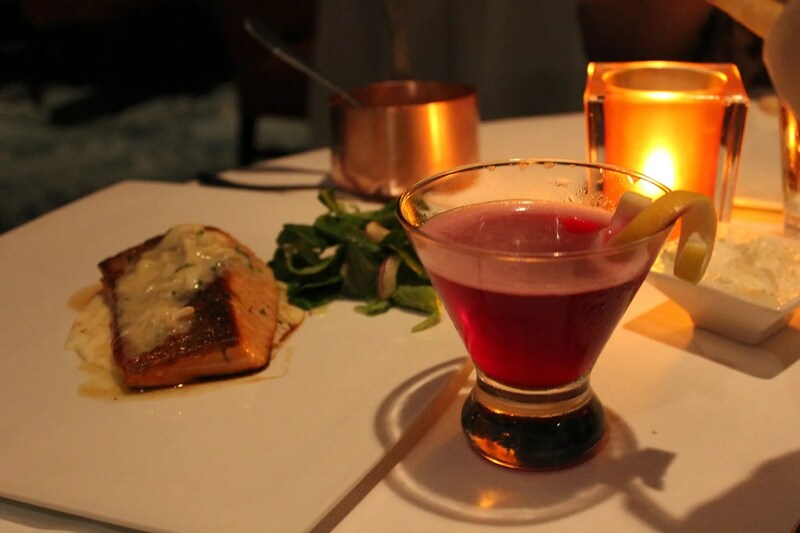 Like the Coral Reef restaurant at Epcot it has an aquatic theme, but bluezoo is more upscale. Here are a few pictures that might give you an idea of our surroundings (although they do not do it justice since most were taken with my camera phone). This picture shows a table setting and also the rippled wave design can be seen on the back wall. 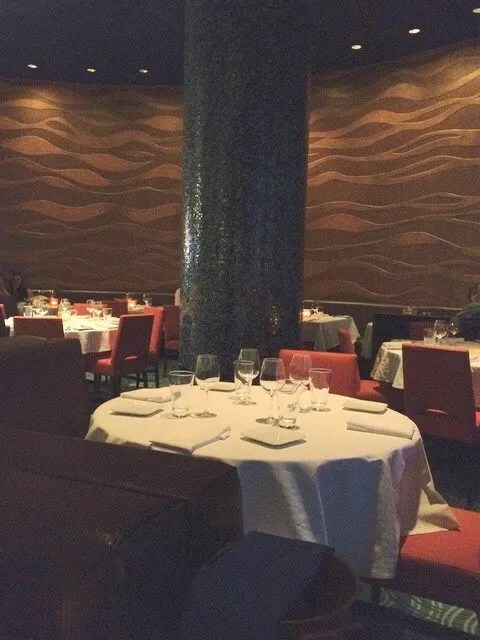 This picture shows the silvery-blue curtain sheers which hung from the tall windows of the restaurant and you can also see a little of the carpet, which has a pattern that looks like swirling water. 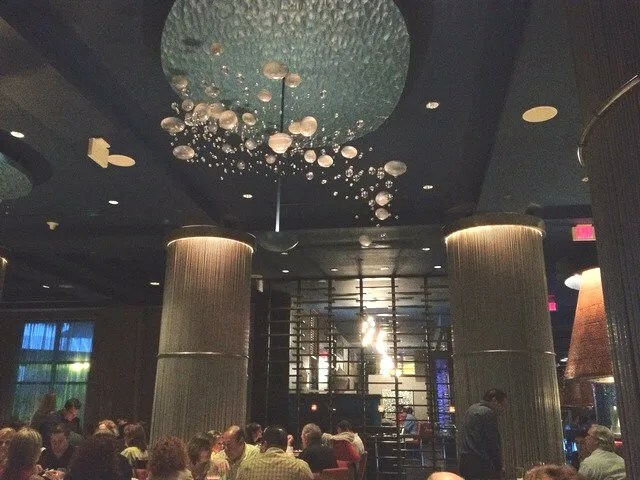 Completing the effect, are light fixtures that look like bubbles floating in the air/water. I was so busy looking around and taking pictures of this beautiful restaurant that I forgot to take any of the menu. 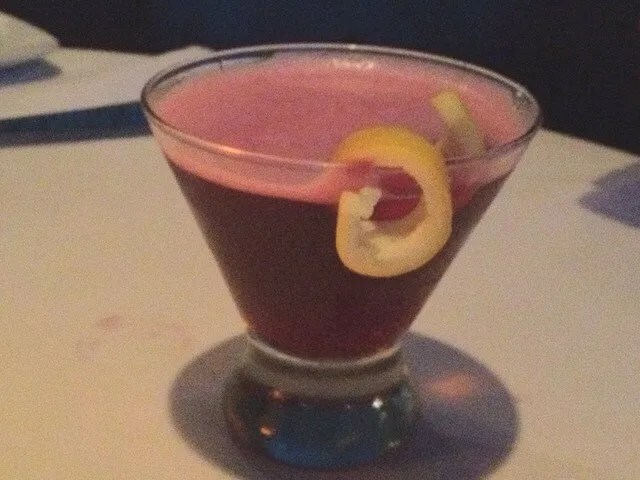 This was described as being berry-infused Ketel One vodka with a splash of fresh lemon. Surprisingly she didn’t care for it, saying that the sweetness/tartness of the berry flavor was just too intense. 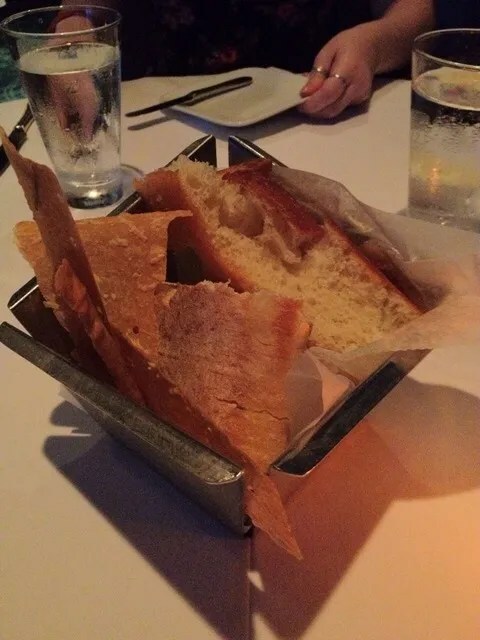 Next came the bread basket. This was a much more generous size than the bread basket we had received at lunch, so I guess it was just at Le Cellier that they thought we needed to cut back on our carbs. Anyway, the basket contained at least two different breads. One was a ciabatta and the other a crispy lavosh that was cheesy flavored (perhaps parmesan cheese?). There may have been a third kind of bread in the basket, but I don’t really remember it if there was and you can’t see it in the picture. These were sprinkled with parmesan cheese and rosemary. They were also supposed to have crushed garlic but I could taste very little garlic, if any. 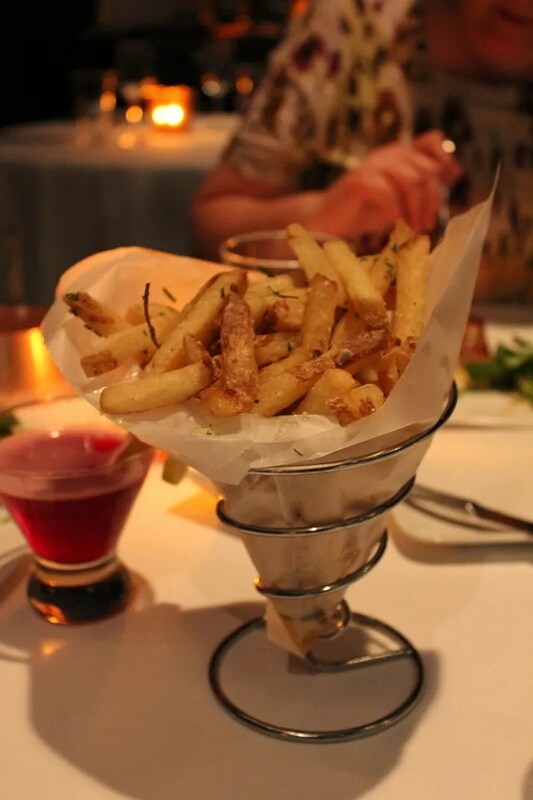 The fries were a tad bit greasy and weren’t as flavorful as we thought they would be, so we all agreed that they rated only an “Okay”. I really enjoyed this! 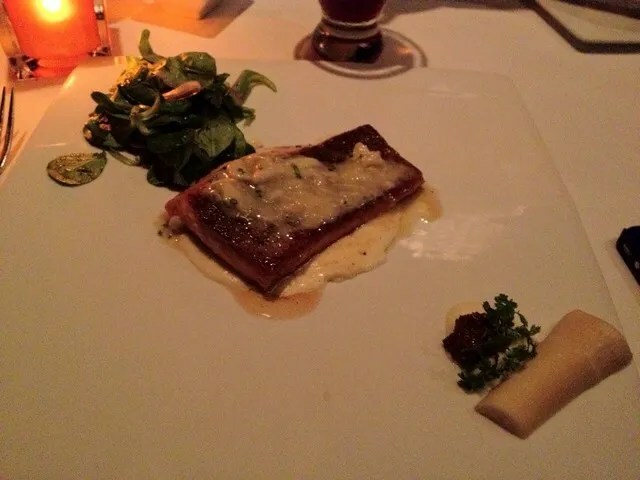 The fish was very mild tasting and was nicely complemented by the very rich and creamy taste of the sauce. I’m sure this sauce contains loads of butter and heavy cream in addition to the crabmeat and dijon mustard, but I also think it probably had some white wine and maybe even a hint of lemon juice??? Mmmmm…so good. 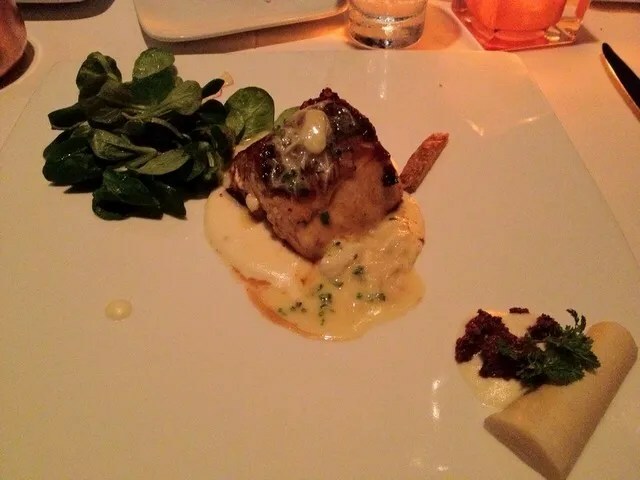 The fish was served on top of a thin layer of potato puree and then a small amount of the crabmeat sauce was served on top of them both. But then you also received a small pot of the sauce on the side, which you could add to the fish yourself. So of course I found myself ladling the extra sauce on several times…Calories be D@#$ed! At first I thought the salad which was served with my fish was spinach, but it tasted sweeter than spinach. After doing a little research, I think it may have been mache (aka lamb’s lettuce). Also on my plate were a heart of palm and a small amount of olive tepanade. Sorry I can’t remember anything about either of these, but they were probably good. When we were told that salmon was one of the three “Simply Fish” options available that night, I encouraged her to order it since she had missed out on the salmon at lunch. Although she didn’t like this as much as the Walnut-crusted salmon that she had at Le Cellier on out last trip, she did enjoy it. As you can see from the pictures, her side items were exactly the same as mine. So it seems that the sides you are served are the same regardless of which of the “Simply Fish” options you choose. To be honest, I didn’t know what farro verde was. I thought it might be the sauce, since verde means green in some languages. But when I looked this up, I found that it is actually a wheat grain. 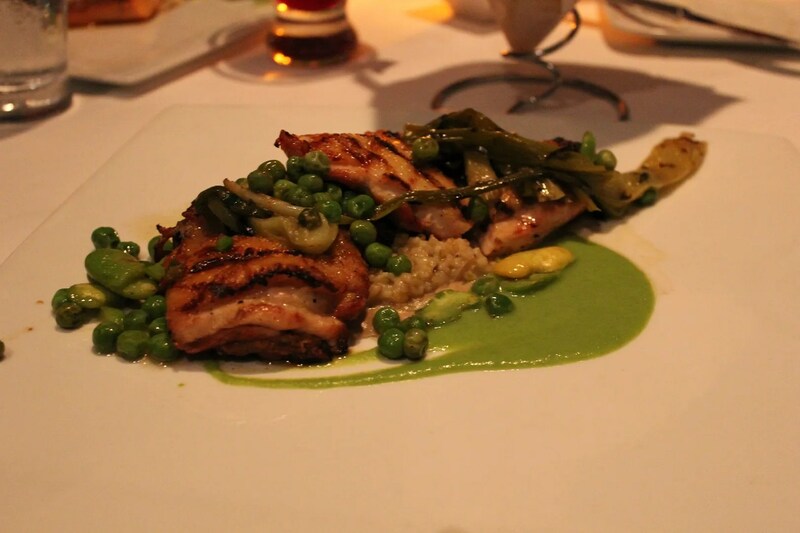 So I’m guessing that farro verde is the stuff that looks like risotto underneath the chicken. Anyway, her opinion of this dish was that the chicken itself was okay but everything else served with it (including the green sauce) was pretty bland and didn’t really add anything to the flavor of the chicken. Therefore, her overall opinion of this was that it was rather boring. Emily loves chocolate. She also loves raspberry. Put the two together and she is in heaven! So she of course gave this an “Excellent” rating, and it ended up being her favorite dessert of the trip. We actually all shared this dessert, and although I wouldn’t say it was my favorite of this trip, it would definitely be in my top three so I agreed with her “Excellent” rating. Our one dissenting vote came from Allison, who only rated this as “Good”, however she is generally not a big fan of chocolate desserts. But with two against one, I gave this an overall score of “Excellent”. I just have one more thing to add. We found the service at bluezoo to be very good, up until the end when we ran into a bit of a problem. After we received our final bill, I noticed that although they had added in the mandatory 18% TIW tip, the 20% TIW discount had not been deducted. Luckily, I caught the mistake and although it took quite awhile to get it straightened out, the discount was finally acknowledged in the amount of our final bill. I’m sure this doesn’t happen often (in the many times I’ve used my TIW card, this was the first for me), but apparently it can happen so I just wanted to give everyone here a heads up. The 20% discount can end up being a significant amount (for this meal it was more than $25), so I wouldn’t want anyone to not receive the discount to which they are entitled due to a glitch in the system. However please note that if the rating was dependent on my opinion alone, it would have been “Very Good“. 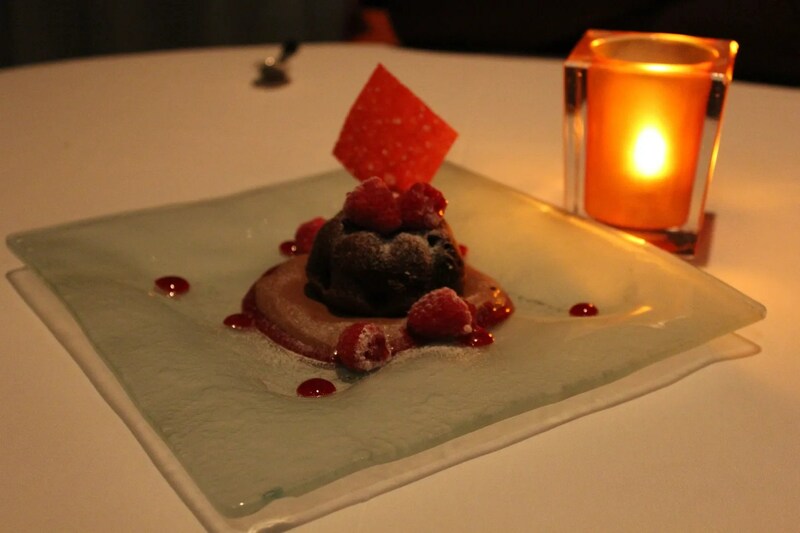 In comparing it to my experiences at both Shula’s and Il Mulino, it would definitely come out on top. That being said, it was not quite good enough to overtake any of my current top 3 favorite Signature restaurants. But it has, however, taken a place in my top 5! And I’m looking forward to returning sometime to try out some of the appetizers and perhaps another one of their many seafood entrees. Assuming a good outcome, bluezoo definitely has the potential to move up in my ranks.